Newport Beach, Calif. (AP) – Officials say a juvenile sea lion was so happy to be rescued after getting hooked by fishing gear off Southern California, it jumped into a Coast Guard boat. 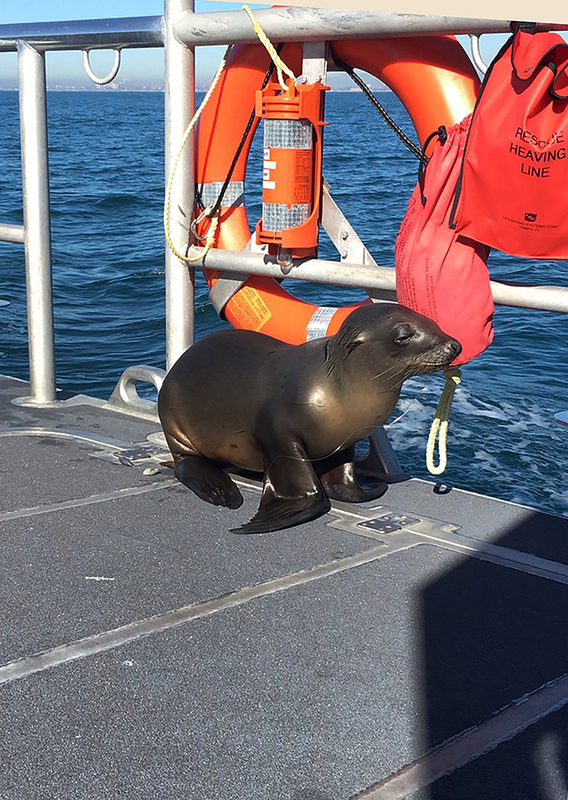 The Coast Guard says a Los Angeles-area crew on patrol pulled the sea lion free Saturday near Newport Harbor. Officials say after a little persuasion, the sea lion hopped aboard the boat and posed for photos. The animal was handed off to a crew from the Pacific Marine Mammal Center, which brought the sea lion to its rescue facility. It will be rehabilitated and released. Henryetta, Okla. (AP) – A small Oklahoma town is echoing the story line of ’80s movie “Footloose” by canceling a Valentine’s Day dance because of an arcane city ordinance enforcing a strict moral code. KTUL-TV reports that the organizer canceled the dance in Henryetta because it would have taken place 300 feet from a church, in violation of an ordinance that forbids dancing within 500 feet of a place of worship. Mayor Jennifer Clason, who was born in Henryetta, says she always knew about the old city ordinance but that it has never been enforced. Police Chief Steve Norman says his department has no interest in doing so. Clason says city councilors will consider abolishing the ordinance during their Feb. 22 meeting. The town of 6,500 is 90 miles east of Oklahoma City. Augusta, Maine (AP) – A Maine man is headed to prison for breaking into the home of an elderly man and beating him with a frying pan. Kristopher Russ pleaded guilty Monday in Augusta to charges that include robbery and elevated aggravated assault. He was sentenced to 23 years in prison, with 18 to be served initially, followed by four years’ probation, while the remainder is suspended. Police say the 79-year-old homeowner, James Young, came upon the 34-year-old Russ when he walked inside his home on March 14, 2016. Russ then hit Young with a frying pan several times before making off with some money. Young suffered serious, but non-life-threatening injuries. Russ’ attorney says her client was “extremely under the influence of drugs” at the time. Russ apologized to Young in court. Sosnovka, Russia (AP) – A village in Siberia that did not have a church until this winter is getting a lesson in faith and life’s ephemeral nature. 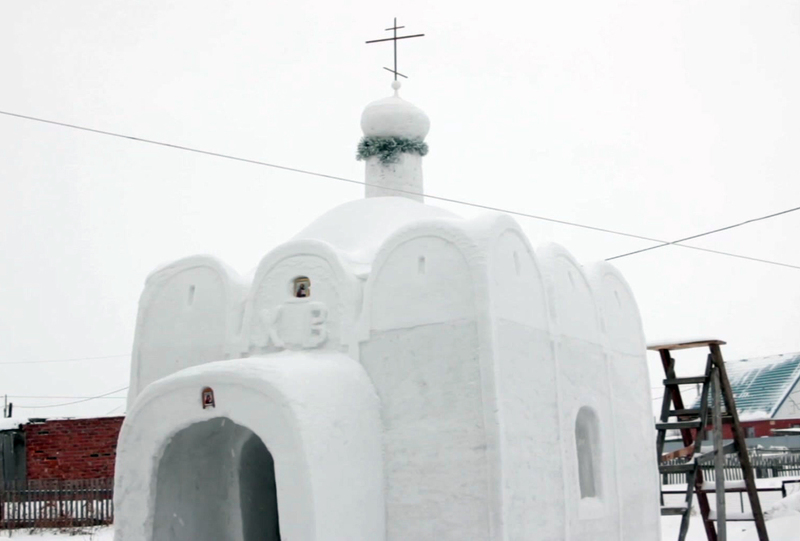 Sosnovka resident Alexander Batyokhtin spent nearly two months building a village church entirely out of snow. The structure will vanish with the season. Batyokhtin worked on the chapel every day, even when temperatures plunged below minus 30 degrees Celsius (-22 Fahrenheit.) He used 12 cubic meters (424 cubic feet) of snow to make it. Batyokhtin says the work wasn’t difficult. His biggest challenges were fashioning the altar and a cross for the roof. “The main thing is to say a prayer and keep a fast for some time, then just go and do it,” he says. Sosnovka administrator Yuriy Kirsh says the church “means a lot to our hearts and souls” despite being temporary.